A stunning early morning view of the Two Shoes Ranch entrance. Mount Sopris is pictured in the background. Gambel oaks, rose and serviceberry bushes, and aspen trees provide the autumn colors in the foreground, and then transition to spruce-fir forests at higher elevation. 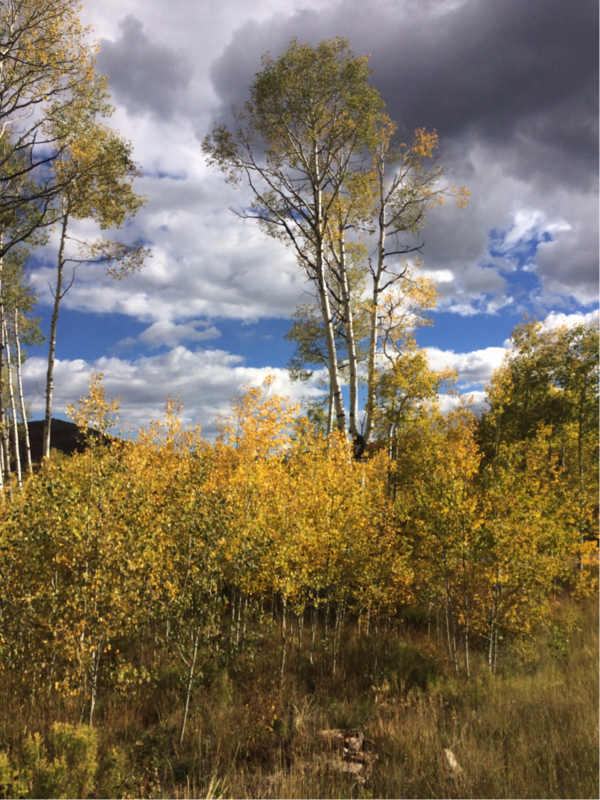 Quaking aspen trees are important providers of ecosystem services in the west. They establish valuable wildlife habitat, support biodiversity, create opportunities for ecotourism, serve as a firebreak for wildfires, and retain soil moisture across forests. 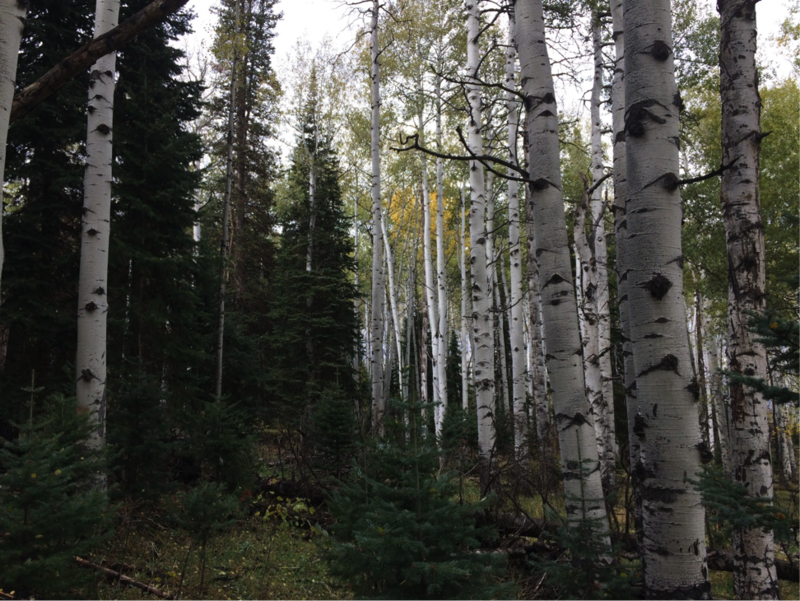 Despite their importance to and prevalence upon the western landscape, aspen trees are widely experiencing rapid die-off at the individual, stand, and landscape level—incidents dubbed “sudden aspen decline” or “SAD” by researchers. SAD is ascribed to a combination of stressors, primarily water shortage. Other contributing factors include mature aspen mortality, lack of regeneration, understory conifer encroachment, disease and beetle infestation, ungulate herbivory, and a handful of other possibilities. Climate change is expected to further exacerbate the effects of these stressors, and land managers are rapidly searching for strategies to deal with what could be the widespread death of a dominant forest-type across much of the intermountain west. Ian Carney, the Two Shoes Ranch manager and a lifelong resident of Carbondale, offers a walking tour of the property for Jack Singer (UCross SAD research team, not pictured), and Nick, an up and coming cow dog of the Two Shoes Ranch. Behind Ian, we can see how by carefully removing mature, dying aspen stems, the property managers have successfully fostered the growth of the next generation of aspen trees. 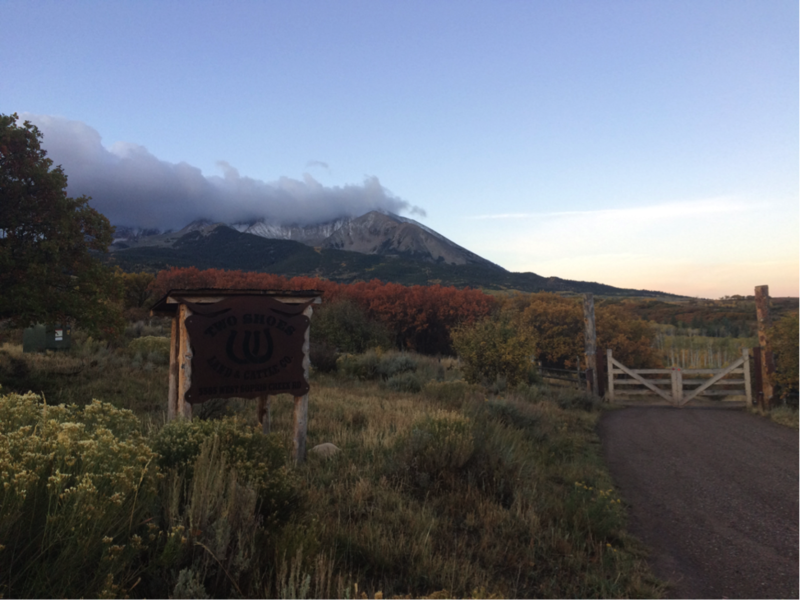 Four students at Yale F&ES – Charlie Faires, Mark Foster, Jack Singer, and Rob Turnbull – are currently working with the Two Shoes Ranch, a private property in Carbondale, Colorado, on this issue. The ranch professionals—Ian Carney, the Two Shoes ranch manager, and Jason Jones, co-founder and co-owner of local-arborist-firm Aspen Tree Services—have directed much of their past efforts toward an area on the Ranch dubbed “Prince Creek.” This area contains an aspen stand deemed critical due to its water retention services and aesthetic value. 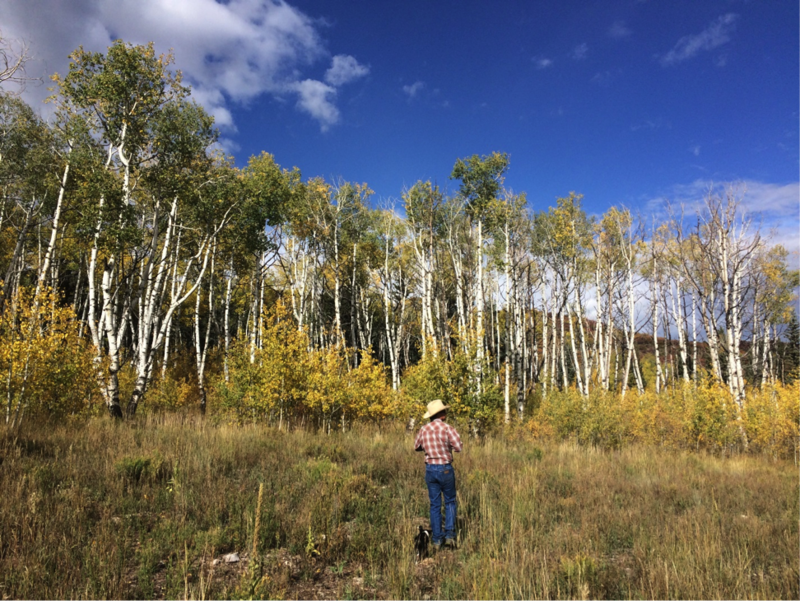 Jack Singer recently traveled to the ranch and was able to view Prince Creek and speak with Ian and Jason about their assessment of aspen management and discuss the next steps to preserve the remaining trees. The students’ on-the-ground research at the ranch will consider SAD’s effects on aspen trees in various stands at the ranch, and the students will recommend management practices to mitigate further aspen loss. The Prince Creek aspen stand, pictured here, is our group’s primary focus. It has been carefully managed to stimulate understory aspen regeneration, which we are seeing here. Notice how beneath the taller, mature aspen stems, there is an abundance of young, healthy stems waiting to take replace them. This is what aspen perpetuity looks like on the Two Shoes Ranch. The team is now drafting an aspen inventory plan for the property that could be implemented as early as 2018. The team is also preparing a comprehensive literature review of all SAD publications, with a focus on scientific literature evaluating SAD’s impact on aspens in western North America. The team is simultaneously producing a management pamphlet that will summarize the findings of their literature review and provide discrete strategy recommendations that land managers can implement. On the upper elevations of the Two Shoes Ranch property, aspen stands are transitioning into spruce-fir forests. These tree species are able to replace aspen stands if juvenile aspen trees cannot regenerate successfully in the understory. This entry was posted in Botany and tagged Jack Singer. Bookmark the permalink.